One thing that we positively don't support here at Nintendo Life is illegally downloading and playing retro games through emulators. As a result it's with a deep breath that we say this, but there's now a way to transfer your retro cartridges legally. A new gizmo called Retrode is on the way to market that allows you to plug in your actual Sega Mega Drive and Super Nintendo cartridges and controllers, before playing them on a PC, tablet or smartphone. It seems that the USB connected device extracts the relevant ROM data onto emulation software and hey presto! Your retro games are playing on almost any device. The fact that it's emulating the ROM from a physical cartridge in your possession is the key, and it's possible to use the device to make a back-up of your software as defined by the Copyright, Designs and Patent Act 1988, though any distribution of that back-up would be highly illegal. It's due out on 23rd January and will set UK buyers back a little over £70. It might be on grey legal and moral ground, but what do you make of it? any word of US release/legality? That's pretty cool but I don't own either console. If they made a NES/N64 one I might buy it. @YashaTheSlayer About 30 seconds of searching on the link gave me this: Retrode. What about if you own the cartridge but not the hardware it was meant to played on. Definately grey. This may not be legal in some countries ( Backing up games that is ). I'm looking at the legal section of the Australian Nintendo site that states the provisions to make backup copies of computer games is not applicable to nintendo games. @Yasha: no, he's talking about having an emulator for a device without owning the original console — emulators are a grayer area than this due to proprietary chips and circumvented lockouts. Putting aside the legality, this looks like a slick device. I love the actual design of it and while I prefer to play games on my couch rather than at a computer, this would be fun to just plug into my laptop when my wife has dibs on the TV. Very, very cool. I will definitely be saving up for one, I stil got a ton of SNES and Megadrive carts very well kept at home. Interesting device but I've already got my games backed up (legally or not I'm not sure) to my HTC desire Z (the whole reason I got the phone was because it has hardware keys that can be mapped). @ennan: If you've downloaded games from the internet, those are illegal copies. You have the right to back up the disc or cartridge you personally have purchased (by using a device like this); you do not have the right to backups of someone else's disc or cartridge. A very good idea. I have hundreds of dollars worth of original SNES cartridges. About having Nintendo buying one of these thing so we can play some Yoshi's Island on Wii VC. "Are Game Copying Devices Illegal? Yes. Game copiers enable users to illegally copy video game software onto floppy disks, writeable compact disks or the hard drive of a personal computer. They enable the user to make, play and distribute illegal copies of video game software which violates Nintendo's copyrights and trademarks. These devices also allow for the uploading and downloading of ROMs to and from the Internet. Based upon the functions of these devices, they are illegal." Also: "Yes. Personal Websites and/or Internet Content Providers sites That link to Nintendo ROMs, Nintendo emulators and/or illegal copying devices can be held liable for copyright and trademark violations, regardless of whether the illegal software and/or devices are on their site or whether they are linking to the sites where the illegal items are found." This is what I gather on the topic. Definitely not legal in the U.S.
At least we have Virtual Console. @ theblackdragon quite frankly the legality doesn't concern me. Morally speaking I'm comfortable - I've bought these games (often multiple times like Zelda, mario bros etc) so having one extra handy copy on my phone doesn't make me a monster. Having one device that plays all my atari, nes, snes, n64, game boy, game boy advance, master system, game gear and megadrive games which I have will me at all times is very handy. I still tend to buy things from VC though as the controls are better. From Nintendo's website, Godot? Really? You think that'll be unbiased? Anyway, IANAL, but my guess is that these wouldn't be illegal as they aren't doing any form of circumvention of copyright protection (if it was able to take DS cartridges which (I believe) are encrypted, it would be illegal in some countries). Besides, if it's the copying itself you're worried about (rather than just having the device), you can play the games directly from the device without ever making a copy on your computer's hard drive - it just emulates a USB hard drive. Then of course, there's the question of exactly where you draw the line - there is a smooth gradient between real SNESes on one side, and devices intended solely for copying SNES games onto other SNES cartridges on the other. This one obviously falls somewhere in between, and there is a reasonably smooth gradient between the possible devices. Another cool feature not mentioned is the potential for plug-in adapters for other games consoles - freely-available instructions exist for building adaptors for N64/Game Boy, Atari 2600, PC Engine/TG16, Virtual Boy and Neo Geo Pocket (Colour). There are also production runs planned for the N64/Game Boy adaptor and a new Master System/Game Gear adaptor. Like any other digital copying problem the way to fight it is to offer inexpensive and ultra convenient means to get the same thing. This device is neither inexpensive or convenient, unfortunately. The virtual console is a good answer to the problem --and I've invested heavily-- but the selection is limited due to licensing issues and companies that don't exist anymore with their properties scattered around. Ethically, why should it matter how you are playing a game if it's an old game you used to own or play --aren't those the only old games most people care about? — that isn't offered by any other means and there is no one willing to take the cash you'd gladly give over? I personally want to support the people who make the media I like to consume with money or whatever they are asking for. It's too bad there's no way to do that in some circumstances. Solution? How about ROMs available in perfect shape FOR SALE from Nintendo and people with the rights to arcade games, for instance. The other ways they distribute some of these games are often inferior to what emulator writers come up with and they are unwilling to develop more obscure games. What would it hurt to put the ROM out and make a few bucks? sigh Would somebody just take my money, please? @ennan: you asked whether your copies were legal or not, and the answer is no. justify it to yourself however you like, i'm afraid you're still a pirate. @29 And I dont think he minds the accusation of being one either. My entirely comment was deleted. So I guess emulation talk is still unwanted. Sorry. But if you think that other 3rd party emulators are illegal then this Retrode thing must be illegal too. Or at least it is in legal limbo, depending on who is doing the interpretation. I think if you don't want emulation talk then you should not start it yourself. Of course I don't think it's unbiased. However, they have a fully trained team of lawyers, and NintendoLife doesn't. They're more likely to understand the laws than any of us are. @Omega: there's a difference between discussing the content of an article and its legal implications and diving off into off-topic discussion of such, which the comment you were referring to before about the Neo-Geo did iirc. This article here, however, is firmly focused on ROMs and their gray-area legality as pertains to this device, thus we're allowing discussion of what's covered in the article in this thread. Not emulators, not hacking. There is a difference — subtle, but present. @Geonjaha I really don't. But I do resent any implication that I'm somehow harming Nintendo. I've spent so much money on Nintendo products - my games collection is massive - literally hundreds of games.. I own every console (with multiple versions of games boys, game boy advances and DS's - I even own the virtual boy) and god knows how many gimmicky accessories, controllers, memory cards, bongos. Having a few games on my phone may make make a pirate technically but Nintendo didn't lose out on anything. If they offered the games on android I'd buy them but they don't and I've never once pirated a game I don't already own. The industry is in a difficult place right now with apple and android stealing a lot of the handheld space. Let's not forget There's a recession on. I'll happily pay for content from Nintendo and other parties because without that support the industry will suffer. Meh, I don't care. I'll play snes games on my snes. 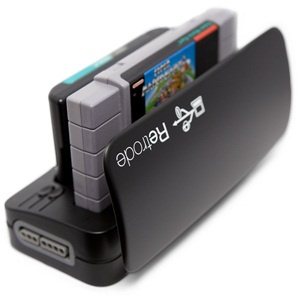 If only it had an NES attachment to boot... still a very awesome idea. @Retro_on_theGo +100000 can't beat using the original console. I just want Super Mario RPG released for the 3DS VC. Is that so wrong? I have the game cart and an SNES, but I can't have it hooked up to my TV at the same time as my PS2. Cool now if only they would make this for other games too. Sounds nice. But now a SNES. Hope they release Virtual Console SNES gams for 3DS. I don't see a reason that it would be illegal. From the text for the article, it doesn't make a backup of the game - it is more or less a physical emulator. If you used it to make a backup, it would probably be a legal gray (personally, I don't see an issue as long as it wasn't distributed). Morally, I think it is fine. If you own the games, you should be able to enjoy them however you wish (as long as it doesn't prevent people from buying them - although the only way to get classic carts like that is used). You've bought the rights to use the program, and this is one way to use it. @The people talking about 3DS VC SNES (wow that is a mouthful) - Nintendo could easily pull it off. The 3DS has more processing power than the DS, and the DS was able to emulate the SNES I believe. Not to be Johnny Raincloud, but even if someone says it's legal to put ROMs up on the Net if they own the original, Nintendo of America, on it's official site, says that it's not and they highly disapprove (but that's not surprising or anything). As the article says, you can make back-ups, "though any distribution of that back-up would be highly illegal." According to Nintendos official website, copying devices are illegal as Godot already said in post#24. Since the Retrode allows dumping ROMs and putting them on the internet, it is clearly illegal in the eyes of Nintendo. Can I use the Retrode to dump ROMs and put them on the internet? Yes, but we don’t think you should. ^ If you buy a game, you own the licence to play it. If you get a ROM from someone else, you don't own the licence and this is illegal. Some consider this theft. However, Nintendo doesn't make a difference with dumped ROMs. Even if you own the original cartridge, they say it's illegal. Yeah, I'm also dissapointed about not being able to use N64 games too. But being able to play SNES and Mega Drive games with the actual cartridge on a PC legally is enough for me to start saving for this. Just curious, Has anyone asked Nintendo of their opinion of this object for personal use only? (1) that such a new copy or adaptation is created as an essential step in the utilization of the computer program in conjunction with a machine and that it is used in no other manner. In other words, if you need to copy a computer program (rip cartridge contents) that you own before you can use it in conjunction with a machine (play it on your computer), it's legal if that's all you do with the copy. A retro game store near my town is selling brand new Super Nintendo consoles for $600. Used systems are around $25-50. If you never owned a SNES, whats the point in buying the hardware when the Retrode is available. I think many people will make a copy of the ROM using the Retrode and then allow others to download the ROM from the internet without them actually owning the cartridge. I would assume Nintendo would think this device is illegal. My understanding is that it is LEGAL (In the U.K. at least) to have a back-up of any media you have paid for and own. There was a court case a few years ago and a judge said that as long as the files were for the owners use and were not distributed then it was ok. However as someone has already stated It's not something anyone here is qualified to rule on, and we should comment on how awesome this product is, rather than discussing it's possible legality. If you don't think it's legal, don't buy it! Simple. If you DO buy it, don't share your ROM's If you make back ups! I think this an awesome product, however I will wait for an N64 expansion before considering a purchase. Just on the legal thing it's my understanding, as a few others have said, that copying your own media for private use is acceptable — the link to the copyright info seems to support that. Kind of like burning a music CD onto iTunes (or whatever) so that you can listen to the MP3. It's not as if MP3 player software is illegal because you could, potentially, rip a CD to your PC and then burn a fresh one to sell. The application is legal, but the act of distributing beyond personal use is illegal. I'm no lawyer, but that's how it appears to me. This gizmo is an interesting concept, but legality is always subject to dispute, and individual's actions and use of an application is also vitally important. Wait so playing ROM's from games on long dead systems is illegal? I guess it kinda makes sense, but really? they're no longer at retail, so they should just be locked away then? As long as they're not being sold for money to anyone, I think these kinds of ROMs are A-ok. If backups are illegal, then explain why Microsoft allows you to install entire games onto the Xbox 360's hard drive. EDIT: Nevermind, I read some of the comments above me. I guess the gist of it is, if you backup the games only for personal use, then it's ok.
@Ren: That kind of thinking in regards to copyright died a long time ago. It doesn't work like that. I've got some low profile battery holders that I'm planning on soldering into my cartridges so that i can replace the batteries. A device like this one will help me backup my saves to ensure that I don't delete my game saves while changing out the CR-2032 batteries. @MasterGraveheart 36: Apparently a NES plugin will be difficult due to the huge variety of ways in which the (physical) ROM can be accessed inside the cart, depending on which cart you have (a real NES doesn't have the same issue because the instructions are in the game code itself - but since the Retrode doesn't understand the game code, it just passes it onto the computer, it will have to know exactly how each cartridge works. This is the same for other systems, but the NES probably has the biggest variety of methods). That's not to say it's impossible - I believe Matthias_H might even be working on it. @jessikitty 47: A Nintendo 64 adaptor exists. There is a PCB layout available on the Retrode website. I believe (I might be wrong) that there was a production run, but I know for a fact that there will be another production run, this time probably a lot more pretty (in a nice case, etc.) - so if you buy a Retrode now, you'll be able to get the N64 plug-in when it comes out. Died a long time ago? For who? I have no qualms doing it. It doesn't work like that for who? Who's 'they' and 'it'? I don't know if it's law but even if it is, what company is going to send out the gaming police after people for copying ROMs of systems that aren't profiting at retail anymore. I understand the legal implications of it, I'm just saying it's more complicated than that. 's truth! Google it! It's called "copyright" and for your information it IS law. @Yanchamaru The ability to commit an illegal act with a form of technology doesn't necessarily make the technology itself illegal. In some cases, it's a gray area (eg. flash carts), but if there are commonly used legitimate uses for the technology, it's usually fine. @Ren Unless it's been long enough for the copyrights to expire and enter the public domain, companies still reserve the rights to their games to rerelease or not as they see fit. The NES was a long dead system when the Wii came out, but many of those games were eventually rereleased on the Virtual Console. Classic compilations on newer systems have always been a popular form of rerelease. You even have websites like GOG.com that make legal deals with companies to continue selling their old PC games. I can't imagine there would be a huge market for this.. If you still own the games you most likely still own the system too. People have been playing these games on the PC since I was, what, 12? ROMs are abundant, easy and 100% cheaper. Not 100% legal, and we all have our own moral standards in that regard. We're human, not government controlled robots. I have no problem with the device, if you own game do what you will. It's not like Nintendo and Sega are still producing and selling those systems. Though this would've been more relevant 10 years ago. Considering Nintendo's response to "How can I fix/replace my ($50) game?" is "Buy a new one at your favorite retailer. They might have it used." I have no moral qualms about backing up games by any means. Most of the cost of the games has nothing to do with the actual cost of the (fragile) medium. If I pay for license to play a game, I HAVE LICENSE TO PLAY THE GAME regardless of the survivability of the medium. If they really cared about some form of legal consistency and loyalty to their customers, Nintendo should be helping players recycle the old NES and SNES carts into ROMs, rather than just milking fan loyalty for $5 per ROM with a VC re-release. They have a right to make money, sure, but I don't see the strength of any legal reason to prevent players from ensuring their $50 game stays playable. "Copying of any Nintendo game is illegal and is strictly prohibited by domestic and international intellectual property laws. 'Back-up' or 'archival' copies are not authorized and are not necessary to protect your software. Violators will be prosecuted." But saying something doesn't make it true. If I say "Not killing yourself immediately is illegal and strictly prohibited", it doesn't mean that everyone suddenly has to go out and commit suicide, to take an extreme example. They can forbid something all they want, but it doesn't mean that they have a legal leg to stand on if you actually do it. In most countries (with the possible exception of the US, but US copyright law seems to me to be moronic anyway, as evidenced by SOPA), you can legally make a backup copy for personal use only - in some, you're even allowed to circumvent copy protection in order to do so (and there's no copy protection on these old games, remember). @Muzer: Your example is poor. Nintendo by law has the right to control how their IP is copied and distributed whereas nobody has the right to tell you to kill yourself (unless you're a samurai in fuedal japan). Copyright law seems less moronic when you're working in a creative field and need to protect your work. If you're an artist it prevents people from using your artwork without permission which when stolen can mean a real loss of income if you're in the business of creating artwork commercially. Not to mention my previously stated point that Nintendo has a team (or teams) of fully trained lawyers, and we don't. I think that they know what they're talking about a lot more than we do. If this (device) was merely a (size-wise) physically scaled-down version of hardware similar to the inside (components) of a real (insert console name), & that the only output this device "transfers" to a pc/etc., is a basic a/v signal, no game code, just audio/video, then this would more than likely be in the same legal/illegal(?) zone, as those knock-off consoles you can find on eBay/Amazon/etc. Since according to the link, you basically extract the rom data to be played on an emulator, I think this falls in pretty much grey area, like some are saying. My own personal interpretation of this is similar to like what @ThomasBW84 #53 said. Certain devices, &/or software have functions that can be used for purposes both legal/illegal, & it's up to the user to not use the software/hardware for illegal purposes. On a slightly related note, I think that to prevent licensing issues in the future, Nintendo(, & other co.s too) should try to work out something w/ the 2cd, & 3rd party devs/publishers/etc. that allow Nintendo the freedom of (possibly down the road) re-distributing certain games/ips/etc. via emulation, or even via literal re-issues of archived (based on/from) master copies of/from the programs/games' full retail production run. With maybe the exception that the older software would be on a newer medium. I could care less. Playing retro titles on a PC for ex doesn't retain that awesome nostalgia and true feeling. Give me a 27" Tube CRT and an NES and i'm good to go. I'd say the best thing it does is giving you less worries. You're not manipulating anything and don't leave any trace when you're making a ROM of a game you already own. So you don't really have to care if it's legal or not. No one's gonna penalize you anyway. PS: Amazing that it also includes your saves. The problem with this device is, that it gives people the technical possibility to copy copy-protected software and share it with others online or offline. And if the possibility exists, then it WILL happen. Products like this are the reason why so many websites with ROM dumps exist. I wonder why Nintendo is unable to do anything against it. Apparently, they have no desire to do so. Yeah, yeah. Justify it however you want, but at the end of the day, you're still a pirate. What about the emulators? Aren't they illegal meaning it's still not legal? There's one caveat to all of this: If someone wants to clean up a severely broken released game (i.e., Breath of Fire 2 USA) to rewrite the translation, is that also still illegal? If the rewritten product is superior, and provided at no cost, who is to say that the fans should be denied from promoting their old favorites? To deny them is to proclaim that customers should be doomed to leave crappy products alone, instead of allowing them to shine to their true potential. What good is a law if it is a bad one? Why bother following a bad law?